Phi Fic means Philosophical Fiction. Each episode, we have a candid dicussion on a heady work of of fiction, full of SPOILERS. Join host Nathan Hanks and readers Cezary Baraniecki, Daniel St. Pierre, Laura Davis, and Mary Claire, plus the occasional guest. Subscribe on Apple Podcasts. Refer your friends to us at PhiFicPodcast.com! Originating from The Partially Examined Life’s Not School and its Philosophical Fiction group. Sign up for a small recurring donation for access to many more discussions! Invisible Cities by Italo Calvino is a novel about a conversation between Marco Polo and Kublai Khan. Calvino’s fragmentary study of urban images is composed of brief prose poems, structured as the traveler's report on the emperor's expanding empire. And even deeper than that, it becomes a question of whether Polo is creating his reports from his imagination or merely describing his native city, Venice. A tapestry of discussion weaves throughout Polo’s poems tying in ruminations on stories, linguistics, and human nature. 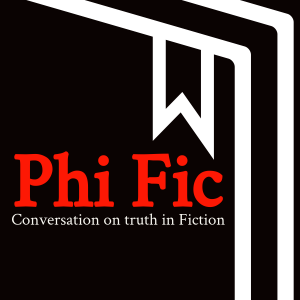 Hear more Phi Fic discussions at PhiFicPodcast.com.